Front Flap: "Thrust onto Egypt's most powerful throne at the age of nine, King Tut was challenged from the first days of his reign. The veil of prosperity could not hide the bitter rivalries and jealousy that flourished among the Boy King's most trusted advisers. Less than a decade after his elevation, King Tut suddenly perished, and in the years and centuries that followed, his name was purged from Egyptian history. To this day, his death remains shrouded in controversy. Intrigued by what little was known about Tut, and hoping to unlock the answers to the 3,000 year old mystery, Howard Carter made it his life's mission to uncover the pharaoh's hidden tomb. He began his search in 1907 but encountered countless setbacks and dead ends before he finally discovered the long lost crypt. 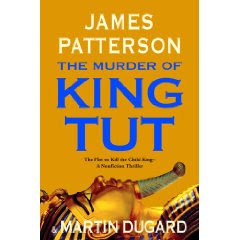 Now, in The Murder of King Tut, James Patterson and Martin Dugard dig through stacks of evidence -- x-rays, Carter's files, forensic clues, and stories told through the ages--to arrive at their own account of King Tut's life and death. The result is an exhilirating true-crime tale of intrigue, passion, and betrayal that casts fresh light on the oldest mystery of all." "Murder of King Tut" is an intriguing look into the past. Taking you from the Present Day of Patterson's obsession with King Tut, to the 1930's and Howard Carter's obsession with finding King Tut's Tomb, to the time of 1492 to 1324 BC and the rulers in Egypt in : Akhenaten, Nefertiti and the rise of the boy king Tutankhamen. Was King Tut murdered or did he perish from a head injury caused by a chariot accident in the desert. Part Fact and part fiction, James Patterson and Martin Dugard put together the case that Tutankhamen was murdered. The book is an interesting, simple read. What would had made "The Murder of King Tut" complete is an index page of references and resources for those who want to find out more, like me. I now want to read Howard Carter's own three book account of his discoveries starting with "The Tomb of Tutankhame: vol 1 - Search Discovery and the Clearance of the Antechamber. Thank you to Miriam of Hachette Books for sending me a copy of the book. "The Murder of King Tut is written in the same fashion as Mr. Pattersons' previous works, meaning it's a page-turner. I was up late, too late, as I couldn't bear to put it down until the end." "The authors did an excellent job of blending what is known of Egyptian history with Howard Carter’s trials and tribulations to create a fast paced, plausible murder mystery. Those familiar with the research into King Tut’s untimely death won’t find the conclusions drawn too surprising but that doesn’t take away from a good piece of storytelling." "Different from the Alex Cross series and other Patterson novels, this novel crosses the border into fascinating, historical – and true. Patterson’s passion wins the reader over early on, and I wanted more when I finished the book. The illustrations were wonderful but sparse, bringing Nefertiti, Tut, Carter and the other characters to the forefront."